Transit agencies put a lot of money and effort into network maps, but are these maps really doing the job in helping people understand their travel options? Here’s a slice of a typical well-intentioned map published by a transit agency, in this case King County Metro in Seattle. The map appears on the agency website and in printed materials, including signage at stops, all over the region. The map above is not wrong, but it is misleading. Most of the transit agency maps I see are misleading in exactly the same way. The problem is that all of the bus lines on this map — both the graphic of the line and the line number bullet — look equally important. If you look at almost any street map, a map designed for motorists or to give people a general sense of the shape of the city, you’ll see clear signals that the lines on the map are not all equal. A Google street map of this same area, for example, uses simple line-weight and color to visually distinguish three classes of road: (a) freeways, (b) local arterials, and (c) other lesser streets. We all use this hierarchy to organize our understanding of the city, regardless of our means of travel. If a street map for a city drew every road with the same kind of line and label, so that Interstate 5 looked no different from the smallest gravel cul-de-sac, we’d say it was a bad map. But it’s not wrong, the mapmaker would say! No, it’s not, but it’s misleading. If we can’t identify the major streets, we can’t see the basic shape of the city, and without that, we can’t really make use of the map’s information. The process of learning any network — roads or transit or any kind of geography — begins with identifying a few features as major, and then understanding how the other features fit around those. If you’re looking at a map of natural geography, you’ll notice the big rivers and mountains before you notice the small ones. If you’re looking at a highway map, you’ll understand the big highways first, and later, only as needed, you’ll study how lesser roads connect with those main highways. Transit customers and potential customers need the same ability to sort the mass of detail presented by a transit network. A transit map that makes all lines look equally important is like a road map that doesn’t show the difference between a freeway and a gravel road. Some of these lines have frequent all-day service. On these lines, a bus is probably coming in the next few minutes at almost any time of day. Some of these lines have infrequent all-day service. You’ll get a bus there, but you may wait a while. Some of these lines are peak-only. If it’s not rush hour, and you’re not going in the peak commute direction, these lines don’t exist for you. One of these lines, the 82, is a nighttime-only route. This line exists only when none of the others do, in the middle of the night. The message seems to be the same across these multiple media: Buses are for people who like to sort through lists of three-digit numbers, and look at piles of numbers on maps. If you can’t handle that kind of complexity, don’t use the buses. Is that really the message transit agencies want to send? Now I can already hear one response to this question. Of course we want people to figure out how to use the buses, but that’s what trip planning websites are for. Just tell us where you are, where you’re going, and when, and our website will give you detailed instructions for your trip. There are three responses to that. First, some of us are spatial navigators, and need to understand our trip on the map rather than as a list of steps. Well, maybe your website gives us a map of the trip, so that’s maybe OK.
Second, narrative instructions are brittle. They work if everything works perfectly, but if there’s any kind of disruption, we’re helpless. Only maps can show us where we are, and what our options are, at every moment of the journey. Third, narrative instructions do nothing to build a person’s understanding of their transit network, and of their city. And if you want to feel free in your city, capable of moving about at will to do things you want to do, that’s the kind of understanding you need. That third and deepest kind of understanding is why people love the regular Manhattan grid. If you’re at Eighth Avenue and 16th Street and want to go to Second Avenue at 73rd Street, anyone can figure out how to do that, and about how far it is, based on locally available cues. Part of the joy of this part of Manhattan is the sheer effortlessness of basic navigation, the ease with which a basic schematic map can be stored in your head, even if you’re not a spatial navigator. It’s a place where a pedestrian can feel free to go anywhere, in any direction, without being confounded by complexity. Most cities are more complicated than Manhattan, and most transit systems are more complicated than their cities. But I contend that transit agencies have an obligation to push back against that complexity, to make their systems look as simple as possible, to give their citizens (not just their riders) the clearest possible image of how their system works. We may not need this understanding to follow your website’s directions, but it will help us if our trip is disrupted and we have to improvise, and it’s essential if we ever want to feel free to use the transit system spontaneously, for our own purposes. OK, but how to we decide which routes are “major”? This question may sound like a recipe for decades of focus groups, but in my experience, the answer may not be so complicated if we just consider the basics: frequency, span of service, speed, reliability and ease of access. Frequency and span of service, I’m going to suggest, are the most important indicators of majorness, because they are the answers to the question: “Does this service exist when I need it?” Notice that this not a question about service quality, but rather about service existence. Until you’ve verified existence, all the other features of a service — even speed — are irrelevant details. Conventional transit agency mapping advertises where the service exists but conceals when it exists, as though “when” were just a detail. In fact, when and where are equally important dimensions in determining whether a service can be said to exist at all. In more practical terms, we know that in urban transit, frequency is an overwhelmingly important variable in determining usefulness. Modellers will tell you that the most onerous part of a transit trip — in terms of the potential to discourage ridership — is waiting. Frequency, of course, is the variable that governs waiting time. Frequency also determines whether connections are easy to make, and that in turn determines whether transit is really a network or just a pile of lines. The Frequent Network runs often enough that you don’t have to plan your trip around a timetable. That typically means every 15 minutes or better all day, but it needs to be more frequent than that where aiming to serve relatively short trips — as in the case of downtown shuttles for example. If you aren’t willing to plan your life around a bus schedule, you are interested only in the Frequent Network. Infrequent All-day services are the rest of the service that runs all day. This network often relies on timed connections. Peak-only service exists only during the peak period. It mostly takes the form of long commuter-express routes that add lots of complexity to a system map but represent very specialized services for limited markets. These three categories are useful in such completely different ways that I would argue they are at least as fundamental as the three basic categories of urban road — freeway, arterial, and local — that virtually all street maps clearly distinguish. When these three utterly different services are drawn with the same line, as in most of today’s system maps, you get chaos. The chaos may be colorful and visually appealing, but it still conceals the most basic information we need. The complexity of peak-only routes, for example, obscures the simple structure of the all-day network, and the even simpler Frequent Network gets hidden behind both. My recommendation is simple: In a bus network, the three categories of usefulness above should be represented by three kinds of line: a visually strong line for the Frequent Network, a lesser solid line for the infrequent all-day service, and some kind of dashed line for peak-only. More fundamentally, the test of a map should be that anyone can see the Frequent Network standing out from the rest of the map, and that anyone can see the total all-day network — frequent and infrequent — standing out from the more complicated and specialized peak commuter express services. But it’s also not hard to highlight the Frequent Network even in a more complex map of the entire system. Look at the Minneapolis-St. Paul map here (click on the middle tab, “Regional System and Downtown PDFs”) and you’ll see all the maddening complexity of the whole system. But you’ll also see simple yellow highlights on certain lines — both light rail and bus — that run every 15 minutes or better all day. These are the Frequent Network, the structure of services that busy people can potentially count on. Metro Transit also publishes a nice frequent network diagram (here and click right tab). Here’s a piece of it. Frequent Network mapping is also important for its secondary audiences. If everyone who wanted good transit had access to this map, they could make decisions about where to locate that would gradually re-organise the city so that people who valued transit were close to good transit, thus making better use of the transit system’s finite resources. The Frequent Network is potentially useful to anyone deciding where to live, where to shop, or where to start a business, and also the land use planners and developers who make the same location decisions. If you just show such people the map of all services, with no differentiation, they won’t be able to identify which services would really be useful to them, and will thus be less likely to make good location choices. I have done quite a bit of work on this topic over the years, and have contributed to Frequent Network mapping decisions in several agencies, including Metro Transit in Minneapolis – St. Paul. The idea encounters a lot of resistance, and isn’t done in most of the places where I’ve proposed it. But I have yet to hear a clear argument for why it’s a bad idea to highlight and market the network of high frequency services. I would love to hear such an argument, and perhaps a marketing and mapping expert will provide one in the comments. UPDATE: Actually, I have heard two such arguments. 1. “Finances are uncertain, and we can’t be certain we’ll always be able to keep to a 15 minute headway.” In fact, this happened in Portland last year, when budget crises forced the transit agency to cut some frequent lines to 17 or 20 minute frequency. But this objection has an easy answer. The Frequent Network lines in Portland are still the most frequent lines, and there’s a clear intention to restore these frequencies as a priority. It is better to say “Sorry, but the budget is really bad and we’re having to cut the Frequent Network to every 20 minutes or better” than it is to just abandon the Frequent Network brand, or to never create it out of fear of this contingency. 2. “Our staff is having trouble getting to consensus on exactly what the definition of “Frequent Network” should be. Every 15 minutes or every 12? Frequent even on Sunday or not? Frequent until 8 PM or until midnight? If we set the bar too low, Frequent Service won’t mean much. If we set it too high, we won’t have enough ‘Frequent’ lines to make the term worthwhile.” Yes, this is hard, but compared to the benefits of helping customers identify the frequent services, the stakes of this debate are pretty minor. Make some decision, flip a coin if you have to, and move forward. In general, it’s better to add frequent lines later than to delete them. Perhaps that argues for a stronger definition that gives you fewer frequent lines initially, but that also shows how you can bring more lines into the Frequent Network with small additions of service that you can make as finances permit. This should be required reading for every transit agency. I think the worst maps I’ve seen belong to BC Transit. They range from completely useless to just really damn confusing. Even worse, would you believe that they have no trip planner? Victoria is a tourist city; what kind of tourist would be willing to deal with that kind of information? The mind boggles. 100% agree. The operator just dump every line on the system map. It gives people the wrong impression of a dense transit network. It turns out most lines a mere noise because the runs on limited schedule or night bus. It definely needs a complete redesign. Meanwhile I count on google to find me the right route. I love your analogy to a highway map. It’s hard to believe that a transit agency wouldn’t understand how important and useful this is be after hearing that. At the same time, it’s best not to have too many categories. The AC Transit map has no fewer than 10 different indications of service level on its map, and it’s tough to remember the difference between a solid circle with a pointy thing coming out of it and a hollow oval. In addition, there’s the distinction between lettered transbay routes and numbered regular routes, dashed lines, and about a dozen arbitrary-looking colors. I think the numbering scheme also has some significance, with 6xx routes being school routes, 2xx being in the Fremont area, and 3xx being… something. On the other hand, the maps on the bus timetables are quite good, in that they’re real maps that show the bus route, local streets, and other bus routes in the area. Anon. I agree about the AC Transit maps. They keep track of too many slightly different kinds of span (e.g. Sat but not Sun, Sat and Sun) which are relatively minor details, and these obscure the major distinctions that determine, for most people, whether a service is useful. The AC Transit example made me think of Golden Gate Transit, which does a pretty good job of separating out their classes of service: commute, basic service, and Marin County local routes. There isn’t a distinct frequent service network, since pretty much all of the service runs infrequently (30-60 minute headways, typically). On the other hand, the network is carefully structured with timed transfers to let you fairly easily make connections throughout the system, and the fare system treats it as one trip. These connections seem like something that would be useful to represent on their map. I have been experiencing just this problem while trying to analyse the network in Baltimore, Maryland. While referring to the network map, I have to keep their schedules web page open in order to check whether each service is every few minutes, every hour, or a few times a day. This isn’t necessarily simple; there are complicated orbital routes running every 15 minutes, and bits of radial routes only running every 30 minutes or less. The map (http://mta.maryland.gov/maps/BaltimoreSystemMap-120109.pdf) is also frighteningly confusing, because of detailing the complexities of infrequent routes. Even more bizarre is the inclusion of peak express routes with no indication of where they make their limited stops. Good practice, on the other hand, can be seen in Leeds, the city in England in which I’ve been living for the past three years. The network map (http://www.firstgroup.com/ukbus/yorkhumber/leeds/map/Leedsnetworkmap.pdf) colours routes that run at least every ten minutes at least six days a week with a line colour, while other routes are in grey. The colours match the route timetables, and patchy route branding (that would be very helpful if it were done more consistently). I find highlighting of that kind better than frequent network maps. There will be times I want to go places served less frequently, and a good map will let me know what bus route I need to pick up a timetable for/be prepared to wait for on those occasions. I must note that with just three levels of differentiation within routes added to Seattle’s map it would communicate more information (actually much more) than just three kinds of routes. Why? Because it gives folks more handles to milk more information from the map through inference. While the Minneapolis map uses color to communicate route overlap, such information could be inferred by the careful reader of the Seattle map with the line type strategy Jarrett mentioned. I appreciate the Seattle mapmaker’s insistence on visual simplicity to keep the layer of interest all one color, because of the reticulated distribution of the network (a good problem for a transit agency to have I must say). The deficit is we can’t really follow the branching of the individual routes from one another (hence the profusion of numbers). Where does Route 1 going south head to after it intersects with other routes…who knows? That kind of information could probably be communicated through visual inference if we saw the other layer of indirectly related information of route type/frequency put on the Seattle map. You could still spare the mapreader visual chaos by keeping it all one color, but that extra level of information of basic route type would do a lot actually! In order to communicate route overlap I often see a bad habit of differentiating routes with very subtle gradations of color using very thin lines placed side by side. Now that is visual chaos to me because it begins to bleed out geographic information. It takes away points of inference (which are actually critical for navigation). What’s more, you really can’t tell colors apart using thin lines often, even if you zoomed in really close and even if they are different primary colors of the same tone (think of your colorblind passengers!). I realize in some instances it is necessary to communicate transfer opportunities between stops, but I too am not a fan of adding too much color differentiation to the primary layer. Just to emphasize how difficult it might be to convey such large amounts of information with limited space, I have a lot of difficulty distinguishing between shades of colors. I can tell when a color changes on a line, but if I have to look at a legend, I won’t be able to tell if it is light blue or just a regular blue unless I can fold the legend to move it close to the line on the map. And I’m not even colorblind. I really like using line thickness as a distinguishing factor, but in a dense transit network with overlapping lines, that can muddy up the map quickly. I think the world will be moving slowly toward dynamic mapping on mobile devices, which can change its appearance based on whatever information is most useful to you in that moment. a) The other problem with that Seattle example is that one line represents every route operating on a street, which makes it difficult to follow routes. The DC Metro map is a bad offender… London is difficult but I believe they have published separate district maps showing individual routes. b) In addition to individual routes operating frequent service, I would suggest that the network should highlight corridors where multiple routes combine to offer frequent service (provided that the schedules are co-ordinated to provide even headways). For example, in Hamilton (Ontario) there are a series of routes that run together south from downtown across an escarpment before gradually separating into different corridors in the suburbs — outside rush hour the individual routes are infrequent (30 minutes?) but are evenly staggered to provide more frequent service, at least on the common section of the corridor. c) I have been enjoying the MUNI map lately — it highlights priority corridors, it has a different symbology for limited-stop and express routes (and shows individual stops), it colour-codes routes (crosstown vs. downtown), etc. e) For those that haven’t seen it, an interesting article in Wired on Eddie Jabbour’s map of the NYC subway (the “Kick Map”). good point Jarrett. One of the worst features of the electronic route sign in the first couple decades of use was the inability to emulate the color coding so many agencies had used to indicate expresses, limiteds, and short turns — generally a red green or blue field easily visible at a distance at the bus stop. DC used red slashes over the route number to indicate short turns. when these colors were used on the buses it was easy enough to match them on the maps. AC Transit’s categories are too fine grained but if they followed the policy distinctions laid out by their BOD of trunks, feeders, and neighborhood services, they could easily do colors not only on the maps but the bus and stop signage. I completely agree. When I was in DC, I had to keep one window open with the confusing PDF map, and another open to see what the frequency was like. I could have taken any of 5 lines from where I was to where I wanted to go, but I had to go back and forth. One line ended service at 6pm. The other was every 90 minutes etc. Now, you propose a 100% graphical system, but another way to make this work would be to use the very numbers you criticize. It would require major changes, but…. High 2 digit numbers could be routes in the city which are less frequent. Say, 60-99. Lines beginning with 300, might be express routes. 301, 302, 303 etc. The 500s could be for peak service routes. 600s for out of town commuter routes. Night lines could start with 900, or just have the letter N added. Example, 17N would be the night version of the frequent route 17. Not as frequent, but runs all night. You use road maps as an example, well, our highways have a complex number system, where the route number indicates if the highway is east/west or north south, where it is and if it is part of another route. The next critique would be “renumbering everything would be a major PITA”. Well, the highway people are forcing various states to renumber ALL their exits from sequential to mile based, and I think in comparison, its not a big difference. Also, another example of a system that does it graphically would be….Curitiba. Yes, them. This is the map of the highest frequency buses ONLY. No local routes. Depending on how long the joint section is, you can think of it like a train line. Inspiration: Boston green line, branch b,c,d,e. Route 3 (= trunk route). 3a, 3b, 3c, 3d are the different “branches”. Corridor 1: 10, 11, 12, etc. Corridor 2: 20, 21, 22, etc. Corridor 3: 30, 31, 32, etc. …with the different numbers reflecting different branches. Single numbers would refer to a handful of short shuttle routes. Buses on four east-west streets would be the 10s to the 40s. One L-Shaped route would be the 50. Buses on two north-south streets would be the 60s and 70s, and the 80s would refer to the North-South light rail. Numbers in the hundreds would refer to orbital routes. Express buses, presently split between the 100s and 400s, would all be in the 400s. Great article! I too use the simple definition of “frequent” which is any route I can use without a schedule. The cut-off frequency necessarily varies from city to city – depending on average headways and even cultural conditions such as the value placed on “punctuality”…. But I agree that the distinction between frequent and non-frequent is nevertheless easy to identify in any city, and there’s really no acceptable reason to resist it. Where I live, Brooklyn (New York), there’s a lovely, clean bus map which could nevertheless be greatly improved with information on frequency. We have a culture of frequent subway service which means nobody consults a schedule for a subway trip, ever. PS. I must be “spatial” too, because I would much, much rather have a clear map – hopefully with some indication of frequency – than use one of those “point-to-point” applications that seem to dominate these days. Sure, part of that is because I just like to look at maps, but even when I’m actually traveling and need directions, I find a map which tells me “this is where the routes go and this is how often they run” to be vastly more flexible than the limited one-time information those applications give you. Sorry, I meant to add the point that us New Yorkers’ habitual reliance on frequent subway service ought to – but doesn’t – carry over to the bus maps. Thanks for the link to Jabbour’s new article – I’ve been following the evolution of his Kick Map for awhile and though I have disagreed with some of his design choices, this is the first time I’ve seen him explain many of the choices he made in such detail – he does a good job of explaining the aspects of his map which make it a good “fit” for the unique demands of New York. Sylvan, a trip planner is coming. The basic issue is that BC Transit simply doesn’t have the money or human resources to get it done quickly. As for the second downtown map, it needs some hierarchy but aside from that it is fairly clear about what buses stop where. Rhywun, in New York I’d guess that there would need to be four levels of frequency: peak-only, infrequent, frequent, and very frequent. The reason is that in Manhattan and the inner parts of Brooklyn, the Bronx, and Queens, nearly every bus would qualify as frequent using the 15-minute definition; the important distinction would be a much stricter cutoff. However, in the outer parts of Queens and in Staten Island, a lot of buses run just every half an hour, so a 15-minute distinction would be useful. Jarrett, do you think this four-way distinction can be useful in a city with a very high-frequency core, or does it just complicate matters? I dunno Alon… I tend to think that 4 levels might be too much. I think in NYC the cut-off should be at most 10 minutes headway. My personal experience with the system’s reliability suggests that any route with a scheduled headway greater than 10 minutes is too unreliable to count as “frequent” by my personal definition (can I use it without a schedule). Other distinctions such as peak-only or weekends-only might be best left for specialized maps. That would leave just two levels on my idealized “peak” map. But you’re right that the cut-off would be lower than in many other, less-dense cities. I did my own study of Brooklyn routes a while ago and nearly half of them were scheduled to arrive every 10 minutes or less during peak hours. Not only that, but the range of headways was quite evenly spread out – there was no obvious cut-off point which might indicate that one route is “frequent” and another isn’t. I gave up the exercise in frustration. There were way too many routes with a 10-minute headway, but when I reduced the cut-off to, say, 8 minute headways, the collection of such routes didn’t form any sort of rational “network” – it was just a bunch of routes all knotted around the areas we know are most dense. one layer of meaning could be fully separated IMHO: night buses. In Vienna you’ll only see night bus network maps when you are at a stop that one of those buses use. Since most going-out neighborhoods are in the vicinity of the ring-road, it’s usually your best guess to just get down there. Most lines circle around downtown, so you can catch them anywhere along the ring-road in any case. Another example of a map prepared in the way you suggest is the Utah Transit Authority maps. They use green for 15 minutes service, blue for less frequent service, red and yellow for peak hour service, purple dotted line for flex route service, and black for special service like school trippers and ski bus service. I am not sure if I agree though at the need to show the frequency of service on a map.I planned a trip last year to go to the Pacific Northwest to see all of the new rail that had opened in Portland, Seattle and Vancouver. I wanted to go to locations that were not on a rail line. The first step I did was to use a map to determine if I can get to that particular location and if I can, what bus route will take me there. When I was looking at the map, I was not concerned at how frequent the service was. Once I knew I could get there, I then referred to the timetables to plan my trip. So while it may be useful to have it right there on a map, it doesn’t necessarily make the map bad if it is not shown. When you look at that map of Seattle’s bus service, is the core problem really the map’s design, or is it the design of the bus service? While I don’t disagree with Jarrett’s point that for a given service design, a more useful map should be created, I also believe that what really needs to be done is a more useful and simpler bus service should be designed. The Seattle service map was designed based on a belief that everyone deserves a 1-seat (no transfer) ride to downtown within a few blocks of their house, plus express service at the peak (vs. increasing frequency at peak instead). There are far too many bus routes which only run every 30 minutes (and are not frequent) and don’t connect to anything at the outer end. Even in this little map segment, there are easy ways that routes like 19/24/33, 1/2/3/4/13, 15/18/17, 26/28 could be made simpler and easier to use. Carl, to answer your question: yes. While on a recent trip to Baltimore, I used light rail to get into downtown for a meeting. After that, I wanted to go to lunch by bus in a different neighborhood. I found the bus line on a map easily enough but had to dig through several timetables to figure out bus service was too infrequent to make that part of the trip worthwhile. All lines on the system map looked equal and I assumed the headways in downtown would be adequate for my needs. They weren’t! Something like what Jarrett suggests would have been very helpful. @ Zoltan + Jeffrey B. The San Francisco Bay area has another good example of rational route numbering – SamTrans. The major North / South routes are #9# : 292 (US101), 390/391 (El Camino Real w/ BART stops), 397 Owl (via Millbrae Inter-modal). The route numbers are clustered (second digit) by how far down the peninsula is their service area (“9” is reserved for multi-city service). P.S. Arguably, the #292 could be the #392 because it stops at SFO which has a BART station. But making the connection from SamTrans to BART is ONLY for transit geeks who are maze happy and don’t mind the $4 surcharge. Out of interest, as I’ve been in Baltimore and looking at the transit network, where were you trying to go, on what route? 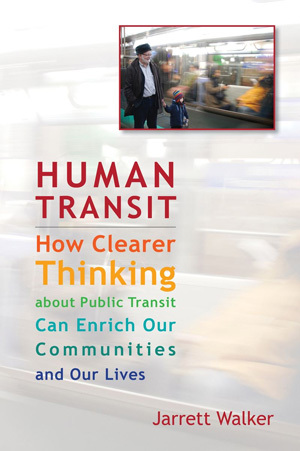 At Jarret’s Vancouver talk he mentioned the concept of “freedom” in relationship to transit. His gist was that people’s love of cars is really a love of freedom, and that a good transit system can instill that same sense of freedom. Maps are a big part of this. When I was a kid I used to love looking at the transit map and dreaming of all the places I could go. Hear hear. Case in point – my inlaws are stopping in Ottawa for a few days en route to visiting us in Kingston (Ontario), and I hesitate to send them on OC Transpo for any trip given the system complexity. They’re planning on staying downtown, literally across the street from a Transitway stop, but I would hesitate to recommend they take the bus to the Canadian War museum a few stops west, just because of the profusion of routes that call at the stop. Sending them on the subway in Toronto? No problem, even when it involves connections. Buses in Ottawa? It’s a mess. The use of 8x and 9x numbering for routes that run exclusively or mostly on the Transitway helps a bit, but there are enough exceptions that even a transit fan like me has trouble keeping it straight. And don’t even get me started on their maps. Services every 15 minutes might be frequent for intercity connections, but for innercity routes certainly not. And not just in New York but almost everywhere outside North America. Yesterday I caught myself getting rather impatient when waiting longer than longer than two minutes. I even wondered whether a minute in Berlin last longer than 60 seconds. @Zoltan: From Calvert Street near the SHA Building to a deli on E. Lombard Street. I don’t remember the route numbers, but it required a transfer from a bus on Calvert to one that wandered around going east. My loss, I know… I ended up taking the light rail car back to the park-and-ride lot in Timonium and eating at the Nautalis Diner instead of one of the best delis in the country. Rhywun: the 15-minute standard Jarrett is promulgating is for off-peak service, not peak service. Alon. Good point. I generally advise that the simplicity of a Frequent Network demand is worth running a few more trips than you would otherwise run. Frequent Network mapping changes the discussion with the public substantially, becuase it encourages people to request more frequency, not just more coverage. 1. Re: Use of alpha prefixes/suffixes to route numbers, especially to indicate a frequent service trunk route with multiple branches: Many scheduling and financial reporting systems used by transit agencies make this difficult to do, especially with scheduling systems that tie to bus stop locations for computerized information (trip planner/next bus) systems. 2. Scheduling frequency on maps: The last editions of both the NYC Transit Borough bus maps and the SF Muni map that I saw listed the routes with frequency statements on the back. For my visits to those cities, I found that so long as the frequency statements were available, that is fine. I totally agree with the need to differentiate the frequent service from the other service types. As you rightly point out Jarrett, language is important in how we understand our world. Whilst coverage services may not be frequent, they do serve a feeder role, and the Peaks, though they do run only during limited hours, are still part of The Transit Network. Line weights or line types could assist identify which is which. Another point is, given that a fair bit of road signage is now fairly common, would an international standard on transit mapping help? One problem frequency mapping does not solve is the real time frequency it should reflect. In Toronto, frequent service is defined as 10 minutes or better, but if a vehicle breaks down or traffic congestion delays vehicles, the map and posted schedules become useless. The GPS postings at stops and smart-phone apps are some remedies for this. They allow people to stopover to do some shopping or eating if they know, in real time, when the next vehicle arrives. By the same token, a highway map won’t tell you if the road is under construction, jammed due to an accident, or otherwise congested. Just because maps can’t give you information about dynamic conditions doesn’t make them useless. I work for a fairly major U.S. transit system…I have long considered pushing for a Frequent Service-type map (I have to admit, I was originally inspired by Tri-Met). I have mentioned it briefly from time to time, even drawn a few maps with different definitions of “frequent” to see what type of network such a definition would portray. The only thing stopping me from pushing hard for this right now is that our system is in a state of substantial flux due to a rather severe funding shortage…I am hesitant to define “frequent” as anything less than 15 minutes from 6 AM to 7 PM, Monday through Saturday, and right now we only have a handful of routes left that would meet that definition. We used to have a few more, but we have had to cut frequencies. In a few years, when we reach calmer seas, this will be a real priority for me. In general though, I fully support this concept. Jacob, why should the current lack of routes affect how you inform your riders? A rider wants the system to be easy to use and get them to where they want to go. “Hiding” the fact that only 2 out of 20 routes (for example) are actually useful does not help that person. In fact, it might help you politically because people will start asking different questions. Someone who doesnt ride transit might say “why are those riders complaining? We subsidize their ride and they can go anywhere in the city they want.” If they see the frequency map is so empty, the anti-transit rhetoric might soften (this is coming from someone in a very red area, where only commies, illegals and dui offenders take the bus, according to most people). Steve Lax, the rider doesnt give a damn about the “scheduling and financial reporting systems used by transit agencies” and why should they? The solution is easier, the route numbers presented to the public do not have to be the same as those used by the back end. That is, route “1b” might be “702” in the system. This is what agencies usually do when marketing a route as BRT. For example, the orange line in LA is route 901 behind the scenes. The silver line in boston is 746, but never EVER displayed as such to the public. The transit systems cant use colors to highlight the most frequent bus routes, because theyd run out, which is why I suggest using the “best” route numbers (1-20). The agency can just pretend that route 2 is like saying green line, and behind the scenes, assign it a system code. J, I think that’s a fair question (although I would challenge your categorization that only frequent service routes are “actually useful”), and one that we will have to consider. You are right -such a map could serve to provide some helpful pressure to increase frequencies, although to do that would require substantial changes to our funding structure, which is quite a feat. Jacob: first, in New York, there are plenty of buses that don’t run frequently at 6 am, but then run frequently from 7 to about 8:30 pm. Granted, if your city’s bus riders are overwhelmingly poor, then maybe it’s justified to start and end the peak earlier. If there aren’t a lot of routes that are frequent by your definition, but there are a lot that come close, then you should relax the definition. This is what Portland did: note how the new frequent map only promises 15-minute service at rush hour. I believe the off-peak frequency is 20 minutes. I think that in this case frequency is relative. You should set the threshold for “frequent service” so that the map is not too cluttered or too sparse. The whole point is to have a system that newbies can get their minds around, right? With regard to corridors shared by multiple routes – we may need some sort of definition of threshold for when they are worthy of inclusion and when they aren’t. I have thought in the past that shared segments equal to/greater than the average passenger trip length should be included, but of course this might vary significantly by location. For example, the 5th/Madison corridor in Manhattan that was mentioned is shared for almost 5.25 miles, definitely long enough…but on the Upper West Side of Manhattan, the situation for the M7/M11 on Columbus/Amsterdam Avenues, is perhaps less clear – they overlap for about 1.8 miles, which is probably longer than the average bus trip (in Manhattan at least), but they be considered a shared corridor for frequent service purposes? It is tough because, while it can certainly be thought of that way for Upper West Side local trips, it can’t be for people coming from the CBD (i.e. Midtown). Any thoughts on rules that can be used for this? It might not be possible to apply a simple distance rule because of local conditions (i.e. long shared corridor might be useless it routes don’t both serve major demand generators at either end, like rail stations). I also wonder about the use of weekends; LA’s 12-minute map doesn’t include them at all, probably because the frequencies are pretty low. Is there any value to having a staggered definition – like 12 min weekdays, 15 min weekends (or even 15 min weekdays, 20 min weekends, for many North American cities) – or does that get too complicated? AB, the M7/M11 pair can’t be used as a single corridor going northbound from Midtown, but it can be going south to Midtown, because they’re only two blocks apart. If you’re going somewhere on Tenth Avenue, the M7 won’t help you much, and if you’re going to Sixth Avenue the M11 won’t help. But if you’re going to Eighth Avenue, either one will get you a block away. PSRC worked extensively with the region’s public transportation providers and conducted analyses of potential growth in transit markets to estimate future demand for increased transit service. The work was based on the philosophy that different types of service increases should be focused in locations that will best support productive routes, optimize local service delivery, and serve multiple purposes including feeding into high capacity lines. The results of this work and broad stakeholder participation are reflected in the policy direction and specific recommendations described in Transportation 2040. Core Transit Services: Light rail, bus rapid transit, and high frequency local buses are considered core transit services. Core services are generally routed to or through areas with higher density population and/or employment. By providing frequent and efficient service to areas with higher densities and mixed uses, core services are expected to draw high ridership. Typically running all day, core service is intended to operate at high frequency and at the higher speeds to the extent practical. Community Connector Transit Services: Transit routed between or through areas that are not dense enough to warrant core service but that the operator is required or has chosen to serve for policy reasons. Because of the land use pattern it serves, it is less likely to draw large numbers of people. Typically running through much (but not all of) the day, it tends to be lower frequency but can operate at higher or lower speed depending on individual routes. Community Connector routes may evolve into core service when transit demand and land use changes warrant it. Specialized Transit Services: Transit routed to serve very specific users at specific times, such as peak period commutes from park-and-ride lots to employment centers. Running only at specific times, it is generally high speed and express, and is typically designed to carry high volumes of passengers. Specialized services are generally seen as complementary to core service; however, where possible, reducing duplicative service is encouraged. Transportation 2040 calls for the region’s designated growth centers and other areas of high employment to be connected through a network of transit services that provide real mobility options for all trip purposes. This transit network is built around core transit services that operate all day and at high frequencies, supported by community connector bus routes. Specialized express bus service will serve productive routes in peak periods. In the (financially) Constrained Plan, Transportation 2040 investments increase core bus transit service in the peak period by 120% and by 105% in the off-peak periods, compared to 2006 levels. Core bus service feeds regional rail lines and provides frequent reliable regional and local service for work and non-work trips. Yes, regional governments do sometimes have this kind of taxonomy of their bus services in their regional planning documents, and they almost always divide bus service into the same categories: frequent rapid, frequent local, infrequent, and specialised (including peak only). Thanks again, Jennifer, for the comment. bus transit frequency maps for the general public – nice idea. i wouldn’t dump system maps right away since most seem to be design to show coverage. As stated above, good frequency maps would go a long to in demystifying bus transit for the infrequent rider and someone new to a particular place. Great thread, I absolutely agree 100%. This should be forward to every transit system’s graphic designer. I also find the one-way streets downtown to greatly complicate and confuse transit riders, especially when looking on a map. Some of these routes then even zigzag and turn on to even more streets downtown making it impossible to figure out on a map. As a transit rider, I like routes that stay on as few streets as possible from end to end, everyone knows it as the Powell Blvd bus, the Sandy Blvd bus, the Barbur Blvd bus, etc. I think its confusing enough that it would be worth returning to two-way streets for the clarity of bus lines alone (nevermind many other reasons). Is there much thought given in transit route planning to just keep the bus on a simpler straight-shot route for clarity even if it means not passing in front of a major destination? AB, the 12-minute routes on L.A.’s map are often as frequent on the weekends as weekdays. The ridership on the high-frequency routes doesn’t drop off dramatically on the weekends. Agree 100%. Easily the most unarguable, obviously correct, vitally useful piece of advice on your blog, and one of the most important things for any passenger transport operator to do. Let’s hope it catches on. Frequent buses still don’t stimulate development, though. The routes move too often. Bus *stations* can stimulate development, but loose corner-of-street stops even on frequent routes? Too crummy, too impermanent. @Nathanael – While I concur that more permanent facilities such as bus stations are more likely to encourage development, I know of many instances where the existence of bus service at the corner bus stop level was critical to development of various types (office, retail, industrial, residential, public facilities). 1. Road network does not support straight shot routings. 2. Without passing the front door of major generators or ducking into business districts or onto mall properties, there would be insufficient patronage to maintain reasonable service frequencies. @J – I agree the public does not care about the workings of the scheduling and financial reporting systems; but, in the case of the system from which I retired,the brand new scheduling system (purchased from a leading international vendor) could not communicate accurately with the trip planner software when the express trips on a route operated on the identical street network as the local trips on the same route under certain stop-pattern conditions. Thus, routes “1” and “1X” became routes “1” and “301”. All trips continue to appear on a single timetable. The destination signs now say either “1” or “301”. While the timetable map is still fairly clear, other maps became more cluttered and more routes had to be listed at bus stops. Counter-example: When York Region Transit launched VIVA pre-BRT in the suburbs north of Toronto, their map had twenty different line styles which all said different things about frequency. This proved excessive and they’ve recently simplified. The pre-BRT lines are, however, still marked very heavily both on the York Region Transit map and on the edge of the Toronto Transit Commission map. >eo. Creating too many categories is counterproductive to the goal of simplification. That's why the three basic categories are all you need, in my view. I am a big fan of transit maps that show frequency, and I have even been involved in getting such a map made for a major US transit agency. And one big reason came to the surface quickly: politics. The problem was that showing anything other than coverage exposes the transit agency (and politicians) to scrutiny in regards to where they put the most buses. They fear that it would clearly expose every area of the city that has infrequent bus service (which it indeed would), and residents of those areas would invariably complain and complicate things even further. I think that the discussions that result from such a map would be great for the improvement of the network as a whole, but I can to some extent understand the fears the agencies and politicians may have. Nottingham City Transport (NCT) reorganised its network several years ago into a core set of high frequency routes branded ‘Go2’, leaving the less frequent routes to be branded ‘Network’. NCT colour codes its corridors, so the ‘Green Line’ for example will include routes 5, 5a, 6,7,8,9,9X, 10, 11, 11c, of which 6, 10, and 11 are branded ‘Go2’. NCT is a municipal operator owned by the city council with 18% owned by Transdev. As UK bus operations outside London are derugulated, NCT in common with the few other remaining municipals operates on a fully commercial basis (no direct subsidy) as a stand-alone company. Transdev Yellow Buses in Bournemouth was also a municipal, but this time Transdev are the majority shareholder. Yellow Buses core high frequency routes are shown on separate maps but do not carry distinctive branding. A little off topic… Since we’re talking about King County Metro and bad maps, check this out. It’s a map of a single route – the #2. But it’s layered with snow routes, snow shuttle routes, the #27 snow route*, express routes and “partial service” routes (what? ), and can take quite a while to figure out where you bus actually goes. This is more or less typical. And since we’re also talking about King County trying to maximize one-seat routes, here’s my commute home in 12 lines of psudo-BASIC code that results from this strategy. *may I point out that it only snows in Seattle every few years? and that last time it snowed the buses couldn’t even travel on these snow routes? It could be worse, much worse. Heh. That’s just plain ugly. I suppose it’s good they at least pointed out what a “special service” is (operates when Lake Washington high school is in session), though it would be nice to point out when Lake Washington high school is in session. I was the project manager for the redesign of the AC Transit system map back in 2002-2003. As such I am primarily responsible for its design, although most of the specifics were worked out by our cartographer, Kristin Bergstrom, who had previously designed the San Francisco Muni map. We adopted a number of principles in its design, inspired by bus maps from Paris (not today’s Paris map, but the version from 2001 – I have no idea if this is online anywhere), New York, and San Francisco. One basic principle we wanted to follow was that there should be a one-to-one correspondence between the ink lines and the bus lines. Many American maps are like the Seattle map, where no matter how many bus lines you have on a street, it’s shown by a single ink line. Trying to understand where a single line goes is very difficult on these maps. One has to hunt around for the bubbles to figure out where the route is going, and sometimes this can be very obscure. For example, on the Seattle map there is a 30 route bubble on Dexter Ave N, and anotehr one further west, on an unlabeled street near Queen Anne Ave N. How does line 30 get between the two places? Does it dip downtown and come back in a U, or does it travel on one of the two sets of east-west streets shown? Or something else entirely? We wanted to make it easy to figure out how to follow where a bus line goes, which we thought was a basic goal of any bus map. We followed the lead of the Paris and New York maps in using colors designed to be as distinct as possible from neighboring routes, so it would be easy to follow the red, blue, or green line from place to place. One compromise we made was that we limited ourselves to the colors available on the LED headsigns (or as close as we could get in print). Unfortunately, the color gamut of the headsigns is limited. On the 2001 Paris map, they used a range of different colors – red, maroon, blue, purple, yellow, brown, chartreuse… We did not have those choices. Our choices were restrained even further a few years later when the CHP decided the red headsigns looked too much like red reverse lights, so we had to rejigger the colors to avoid using red, reducing our palette even further. The advantage is that it becomes clearer much further away that the headsign is blue than what the route number is. If you’re two blocks away and you want to know whether that bus in the distance is the 11 bus you need, or the 62 bus you don’t, it’s very nice to be able to see the purple light and know that you have time to go get a coffee, because the 11 will be blue-green. For line and bubble symbology, we considered a number of different aspects of each line. We did consider frequency, but we ultimately decided that the most important aspects were variance, span of service, and express running. Variance: Even more than now, we had a lot of bus lines that had several different variants – different weekday and weekend routes, routes shortened off-peak, two branches serving different areas, and so forth. Many of these did not have distinct route numbers, even using suffixes. We used different dash patterns to show different variants, and keyed the dash patterns to the frequency guide on the back of the map (which had a from-x to-y listing, inspired by Chicago). As time went on we made some changes, most importantly reducing the number of “all day” bubbles to two, and accommodating the change from 24-hour service on some lines to having parallel 800-series All Nighter lines. Express running: Clearly if a bus is running on a street but doesn’t stop, that’s an important distinction. Much of our express running is on freeways, but not all, and we have a number of limited stop services. I liked the way this was shown on the Muni map, with thin lines with round stops where the limited stops were, and we copied that, more or less, for our map. So that’s what we were thinking back in 2003. I’m not sure we were very successful, and I think much of it needs rethinking. I thought at the time that people who didn’t understand the differences between dash patterns or bubble types would just ignore those differences, rather than be frustrated and confused by their lack of understanding. We didn’t (and don’t ) have the money to do user tests of any of this, and I think that’s something we could have found out. Nonetheless, I think a lot of the principles we adopted are still worth thinking about. Jarrett, reading your post it’s clear that you’re using “The Frequent Network” as a name for service that is both frequent and has a long span of service, but at least at AC Transit the two don’t always go together. Which is a “major route,” a 15-minute service that runs from 6 to 7, or a 30-minute service that runs from 6 to midnight? We’ve had both of those in the past. Maybe this is a detail, and it doesn’t matter as long as “major” is defined in some consistent way, but frequency is just one aspect of a bus route. I, at least, would rather wait 30 minutes for an infrequent bus than wait two hours before realizing that this bus stopped running long ago. Or doesn’t run at all today. The highway map analogy would lead to a better conclusion than a flat all-the-same map like Seattle’s. Better a few types of line than just one. But transit is inherently more complex than the street network in that multiple lines can and often do go along the same street for long stretches, and it is important to know which. If you are planning a trip across town, you need to know precisely where your transfer point is, and where particular bus lines go. It needs to be easy to figure that out. Aaron. All very true, and I appreciate this detail. Let me know if you’d like to expand this into a guest post with some shots from the AC map. The problem you mention about frequencies and spans goes to the way that better mapping produces better service planning. It points to certain situations where span is uneven and makes you ask: “Does it make sense that we’re doing it this way?” Again, I generally recommend standardising span, and minimum frequency, over blocks of a few hours. For example, peak only routes stop at 7 pm, minor or infrequent routes at 9, frequent network goes at high frequency to 11 with some service until 1:00 or maybe all night. Planners should ask themselves how much it would really cost to standardise this way. It limits your ability to do micro-adjustments to span around what you think are local situations, but it also vastly reduces the complexity that drives people away from transit. Visual communication not only will be better for an aging population (I’m not kidding about the shrinking type and I’m not even 50 yet), it should also help those for whom English is not the primary language. With seniors and immigrants both higher-than-average users of transit, this reaches key demographics. The STM in Montréal has announced le réseau 10-minutes-max. Several routes are seeing big service improvements to meet this new standard. However, the standard is a bit flawed: Buses must be running every 10 minutes or less between 6am and 2pm in one direction and between 2pm and 9pm in the other direction. The réseau 10-minutes-max PLUS will be composed of only 11 bus routes and the metro, which offer 10 minute service in both directions all day. I must admit this is an angle of passenger interaction, I’ve never even really thought about. Melbourne (Australia) has no intermodal map at all, so planning anything that requires transferring from a bus to a tram or train to tram, etc is actually impossible without either knowledge of the very extensive network, or using the trip planner on the website. It also has no bus network map at all…. This of course is infuriating and very obvious. However differing frequencies, peak and off peak services, etc is something I’d never given any thought to. Once it’s mentioned it sure seems obvious. Given the current state of management of our transport network I’d say this will happen in Melbourne only after a severe shake up of our system. I’m still hoping they release the “coming soon” map of all services that’s been “coming soon” for 4 years now. If it’s called “frequent”, it needs to actually be frequent on every day that ends in “y”. If a transit system is intended to be a viable alternative to owning a car, Sunday service must be at least as frequent and cover the same hours that Saturday service does. I must be honest: I did not read the whole thread and might be repeating information provided months ago. However, packing too much information on a transit map is not the best idea. The first thing I want to know when looking at a map is how to get from A to B. Without being able to extract this information out of the map, well, the rest is not very useful. Frequency will vary by days and time of day, and is useful to have at a stop, not for the whole network. One of the really amazing characteristics of transit here is that even though it’s already a great service, there is a constant effort to search for ways to make it better. I have just checked out the status of a frequent bus service map for Seattle, and for some reason, King County Metro still hasn’t published such a map for its entire service region, even though the agency lists its frequent service routes on one page of the web at http://metro.kingcounty.gov/tops/bus/frequency-of-service.html . There is frequent service map for downtown Seattle, aimed at showing how to move around downtown Seattle, at http://metro.kingcounty.gov/maps/downtown-seattle-service.html . To show the way regionally, Seattle-area private citizen and transit advocate Oran Viriyincy in 2008 created a Metro frequent service map, posted at http://www.flickr.com/photos/viriyincy/2611606345/in/set-72157605461561235/ . From scattered conversations with Metro officials, I think the issue may be a desire to keep a public (taxpayer) focus on the evolution of the RapidRide arterial “BRT” service, five years so far in creation with years to go, for which maps of all six lines exist, even though the service does not yet in total exist. See http://www.kingcounty.gov/transportation/kcdot/metrotransit/rapidride.aspx . So I know nothing has been posted here in a few months, but I felt the need to post and ask for some input. I just started a research project about designing not only high frequency maps, but maps that cater towards a particular group of riders. This could include the commuters, the tourists, those interested in the social scene, etc. CTA in Chicago does a good job of having multiple maps-the overall, the bus, rail, night, the loop, and sights downtown. Like you all, I am a big supporter of the frequency maps, but how do we turn better map designs into higher ridership? Many studies show that people who are more confidant in their navigating abilities are more likely to ride public transit. Along with these new maps should agencies provide sessions to familiarize people with maps and schedule tables? Food for thought. Another, perhaps cynical reason for not publishing the Frequent Network map: it exposes folly. The Miami, Florida Frequent Network map, for example, would show plenty of vertical lines with very, very few horizontal ones. What, does no one travel from east to west? One comes to discover that there are historical, political reasons for drawing the map that way–you don’t want people from *those* neighborhoods traveling to *these* neighborhoods, especially by transit–that you don’t necessarily want to be put on paper. Jarrett what routes did you proposed for the high frequency network for Metro Transit in the Twin cities Mn. ?Here the buslines does not connect and they have too many branches that make it confusing fro riders.Snelling bus #84 connect to LRT every 30mins only .Rt21 only 1/2 of bus connect to the rt16 .Several routes are offering 15mins services but not listed portion of #3,4/17 .